We offer targeted advertising opportunities for those looking to reach a large, niche audience focused on a healthy lifestyle. Our weekly articles reach thousands of engaged readers and bring the science of epigenetics to the forefront of everyday life. From the epigenetic health benefits of green tea, food, and exercise to tips on how one might epigenetically reduce stress through meditation and yoga, we highlight cutting-edge research and bring to light its potential application to nearly all realms of healthful living. 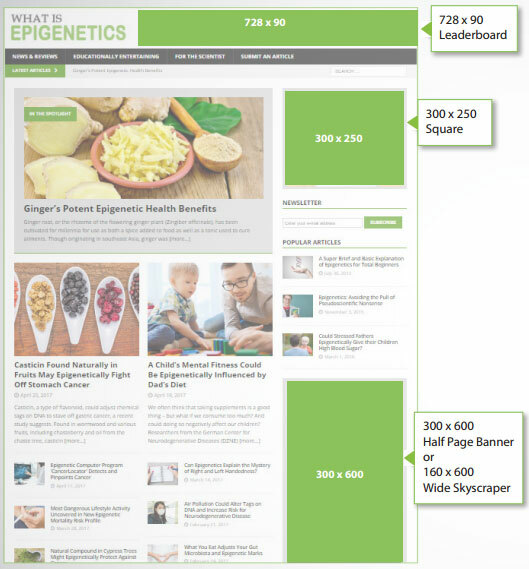 As an authoritative site on epigenetics since 2013, WhatIsEpigenetics.com offers our partners an excellent opportunity to leverage scientifically-driven content to increase awareness of your product or service by an educated, affluent, and engaged audience. Rated 4 out of 4. 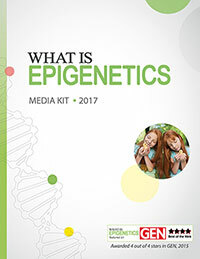 What is Epigenetics is an established New York-based blog churning out original, fresh content on epigenetics and lifestyle subjects since 2013. Relatable and optimized content has established the site as a high-ranking and entertaining source of science-based health and wellness news for a loyal community. Download the media kit for detailed traffic, demographic, and consumer stats. Pricing: CPM with a minimum buy of $100. Delivery: Ads are rotated evenly with our existing ad inventory and can be delivered until desired impressions are met or for specified dates. Download the media kit for ad requirements or contact [email protected] for details. Present your guest article among our relevant, influential content for targeted exposure to thousands of engaged readers. We only accept quality material that will resonate with our audience’s interests and align with our dedication to providing valuable and entertaining information. Pricing: Contact [email protected] for additional information and samples. Our focus is on creating original, high-quality content to engage our audience, providing info that is accurate and cited, while also keeping it easy to understand and entertaining. Aligning epigenetics and lifestyle themes with your product through the reputable voice of What is Epigenetics is an ideal way to reach your target audience. Previous topics of interest of our advertisers include nutrition, fitness coaching, rehabilitation, and counseling. Pricing: Contact [email protected] for additional pricing information for your custom editorial feature and samples. Submit the form below or e-mail [email protected].